The Encinitas Chamber of Commerce hosted a tremendously successful State of the City event last week to a sold-out crowd of 250. As mayor, I delivered the keynote – my message was that, by all objective and subjective measures, the state of our city is strong. We’re in a very good place! I think it’s useful for the mayor to give Encinitas residents a snapshot of our status every year. I put a lot of thought into this presentation, which gave me a great opportunity to reflect and assess on many levels. I began with the budget because that’s the backbone of any organization, then went through the accomplishments, challenges and projects that we’re tackling. 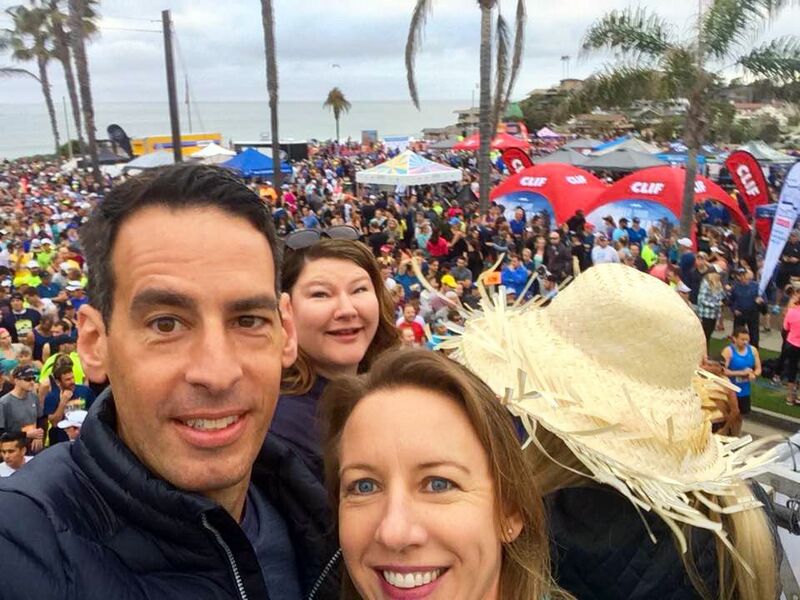 Thanks go to the Encinitas Chamber of Commerce and the large number of volunteers who made this a night to remember. This year we were committed to reducing food and trash waste – volunteers called “Little Leos” (children of Lion’s Club members) and the Solana Center, together with the city’s Parks Department and the senior center, helped organize a system to separate food waste for composting from cups and silverware. This was a nice example of us walking the talk on environmental stewardship. Here are Encinitas Advocate and Coast News stories about the evening. Master of Ceremonies Maria E. Peña-Morales posted a video of the event on Facebook, which can be viewed here. The keynote starts at about 41 minutes into the event. This City Council is focused on improving mobility around the city, particularly for those who aren’t driving cars. Toward that end, at last week’s City Council meeting we adopted an interim Complete Streets policy which formalized our intent to plan, design and maintain community streets so they are safe for users of all ages and abilities. Complete Streets is more of an approach than a set of hard rules, so no specific projects were approved. Here’s a good example of its benefits – recently I learned that as part of the sand dune project in Cardiff, a trail will be constructed for walkers and runners on the west side of Highway 101, just before the sand dunes begin south of the campground. Fortunately, the addition of a pedestrian trail was a state requirement. The state of California has had a Complete Streets policy since 2008. So we’ll gain a wonderful safe pedestrian path along a section of Highway 101 where it’s currently difficult for people outside of cars to navigate because of speeding traffic and lack of walking infrastructure between Cardiff’s restaurant row and Solana Beach. The Parks and Recreation Department (newly renamed “Parks, Recreation and Cultural Arts” to reflect its broader mission) does a “Walk Wednesday” – posting a different walking or jogging trail for residents every week. Here’s a link to the most recent, with a short description of other walks included. I’m grateful that the Parks department has embraced the city’s focus on trails and connectivity with such enthusiasm. We’ve also directed the Parks & Recreation Commission to evaluate land that could be acquired as additional dedicated open space in Encinitas. The money to buy property for this purpose is not yet set aside, and we’ll discuss this at our upcoming strategic planning session. Here’s an Encinitas Advocate story about our direction. The ground is shifting in our effort to make changes to the state laws regarding accessory dwelling units. State housing regulators believe existing law already gives a building inspector broad discretion to approve “alternative means and methods” of permitting a unit as long as equivalent safety standards are met. Basically, this regulatory agency feels the bill is unnecessary. Like many cities, we haven’t been interpreting the language of the code to allow the types of approval we were seeking. One powerful legislator who chairs a relevant committee is opposed to waiving any building codes, stating safety concerns. A key legislative policy committee believes that by giving a building inspector discretion in applying building codes, any accessory dwelling unit permitted under this section would be required to go through CEQA (i.e. an extensive environmental review). This adds far more cost and complexity than is currently required, and basically cancels out any benefits of the bill. What’s becoming clear to me is that after we wrestle with our local regulations and practices, we may be able to narrow the elements of state law that need change. Figuring out the right approach to permitting, safety, qualify of life, housing affordability and neighborhood preservation when it comes to accessory units is pretty darn complicated (like national healthcare policy!). Going through this process with our capable city staff, hardworking lobbyist, erudite outside attorney and helpful state legislator has shown me that even when you get all the right people in the room, solutions aren’t obvious or simple. However, it is a fascinating process and I’ve been continually impressed with the intellectualism and sheer capabilities of the people involved in policy-making. The City Council recently approved some structural changes to the way the city staff is organized in order to streamline, provide better customer service and allow the City Manager to meet the City Council’s goals. For example, the new structure combines parts of Planning and Engineering into a “Development Services” department so that there’s a “one-stop shop” for these services. The industry standard for turning around moderately complex permits is one-to-two weeks, but the city currently takes three-to-four weeks. Additionally, the California Permit Streamlining Act requires that a discretionary permit have a completeness review and notification to the applicant within 30 days, but it takes our staff upwards of four-to-six weeks to commence review. The roles and span of control among managers has also contributed to a backlog of work. The internal structural changes should resolve some of these issues that directly affect the public. Here’s a San Diego Union-Tribune article about the changes and here’s the exceedingly well-written and comprehensively presented staff report on the issue. 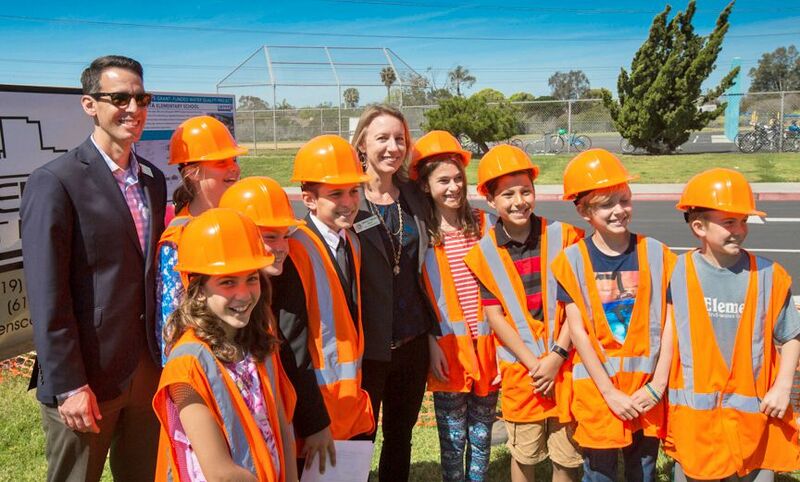 The students at Flora Vista Elementary School in New Encinitas designed, engineered and built a storm water treatment retention area near their school’s parking lot to reduce the pollution that runs into the storm drains. Councilman Joe Mosca and I enthusiastically congratulated them on this hands-on accomplishment at a recognition and groundbreaking event. The Climate Action Campaign nominated the City of Encinitas and our very own Environmental Commissioner Jim Wang for their Agent of Change Awards as part of their NightCAP Annual Awards Celebration on April 12, 2017. Congratulations on the nominations; the winners will be announced at the event! The Arts Commission will consider at its 5 p.m. Monday meeting at City Hall what type of art to have on a large retaining wall that SANDAG is building along the rail corridor. Here’s a San Diego Union-Tribune article about it. Feel free to show up and speak if you have an opinion! Two of my City Council colleagues publish excellent, thoughtful newsletters that highlight what the city is working on and their own perspectives on important issues. Here is the most recent newsletter from Tasha Boerner Horvath and you can subscribe here. Joe Mosca’s latest newsletter is here, and here’s the subscription link. Finally, I’m very much looking forward to our strategic planning sessions on April 18 and 20, where we’ll be able to set our city priorities for the next two years. I feel great about the direction of Encinitas and the progress we’re making. I hope you do, too!